The Nets loved Robinson's unorthodox shooting style, which involved scooping the ball toward the hoop then falling to the ground in pain. Hawks coach Bob Weiss never trusted Robinson, mostly because he never believed his first name was Rumeal. 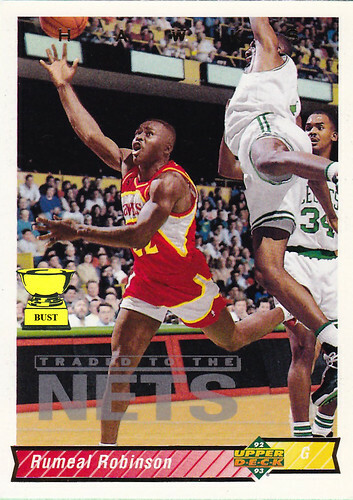 In return, the Hawks received Roy Hinson, Mookie Blaylock, Mookie Wilson and a housecat named Mookie. It was the first time Robinson was traded. It definitely was not the last. Robinson actually demanded the trade. I mean, who wouldn't want to live in New Jersey? "Welcome to Camden, New Jersey! Here's your concealed carry license, your attack dog license, and a complimentary box of hollow points! Enjoy your stay!" Actually, I'm more worried about the Boston defender that looks like he's dodging a car. It's one thing to get posterized by Jordan, it's another thing to get totally BLOW'D UP by Baby Rummy.